Portland, Oregon! One Hour Only! This weekend, “all corners of comics” includes mine. I’ll be doing a signing at the Comic Book Legal Defense Fund booth this Saturday at Stumptown Comics Fest in Portland, Oregon. Where? Stumptown Comics Fest, at the Lloyd Center Doubletree Hotel Exhibit Hall, 1000 NE Multnomah Street, Portland OR 97232. No, I mean where? Like, once I’m actually at the show! Oh. In that case, I’ll be at the CBLDF Booth, which is Booth #25. When? Well, the show is Saturday and Sunday, April 24th & 25th, from 10:00 AM to 6:00 PM. Yeah, yeah. I knew that from your first paragraph, pal. And the signing? 3:00 PM to 4:00 PM Saturday. What else do I need to know? Like are they charging for signatures, or what? Gee, you’re getting a little belligerent there, imaginary-reader-born-of-my-subconscious. Tickets for the signing can be had at the CBLDF booth itself. Tickets are free, though donations are encouraged. 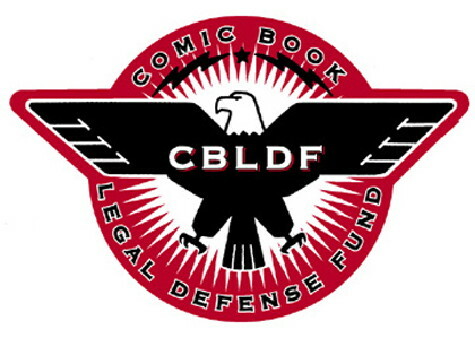 The CBLDF is a worthy cause, and deserves your support. Any limits on stuff you’ll sign? Just my usual. I’ll sign pretty much whatever, but if you’ve got a big stack and there’s a line behind you, I don’t want those other people to have to wait through it all, so I may just sign a small chunk of ’em and then you can go back to the end of the line or come back later or whatever. If there’s no line, I’m in no rush. I’ll sign, answer questions, chat, whatever. Why did you let Superman beat Thor? Don’t you know Thor’s magic? They paid you under the table, didn’t they? Oh, shut up. And they mailed a check. So if you’re at the show, drop by and say hi, even if you don’t have anything for me to sign. The CBLDF could use your help, and it’ll save me from twiddling my thumbs the whole time. For more on Stumptown or the CBLDF, click the links.